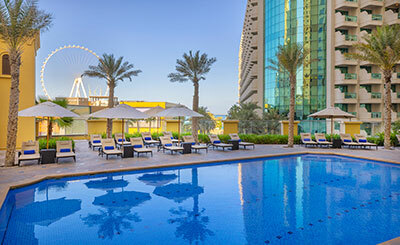 Located ideally on the Jumeirah Beach Hilton Dubai The Walk, is a great place to stay whether you’re travelling for business or leisure. 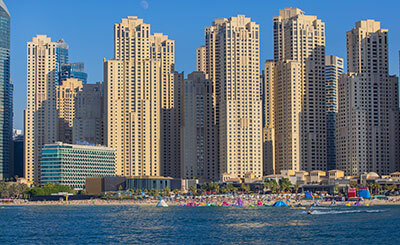 There are some of the city’s most coveted attractions nearby such as the Marina Mall, Mall of the Emirates, home to the largest indoor ski dome, Ibn Batuta and so on. 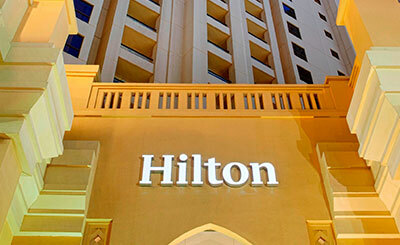 The hotel’s a 40 minute drive from the Dubai International Airport. Ideally named The Walk, this property has one of the best chunks of private beach and you can enjoy long coveted beach walks with your friends and family. Proximity with some of the major attractions in the city is also a positive, as you don’t have to spend countless hours in commutation. BiCE restaurant , the award-winning, modern Italian restaurant is known by insiders as the place for star-spotting in Dubai. Its also the place for authentic Italian food for both lunch and dinner. Pachanga : Pachanga is a meat and seafood based menu that blends innovative flavours and cooking traditions from across the continent, including their signature dish Churrasco from Brazil. Wavebreaker, perfect place to enjoy a light snack or something from the charcoal BBQ, including fresh Canadian lobster, surf n turf or chicken skewer, with your favourite drink. BICE Sky Bar:- Situated high on the 10th floor of the Hilton Dubai Jumeirah Resort one of Dubai's best-kept secrets has to be the stunning BiCE Sky Bar. 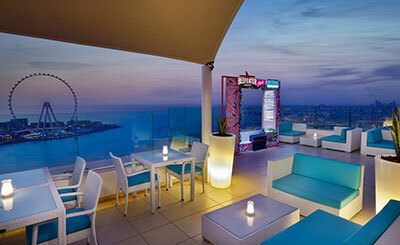 Pure Sky Lounge:- Pure Sky Lounge is a chic and modern lounge, bar and restaurant located on the 35th floor of Hilton Dubai The Walk, in Al Bahar, JBR. With indoor and outdoor seating areas. Studio One:- Enjoy live sports events on the big screen in the relaxed atmosphere of our sports bar, Studio One at the Hilton Dubai Jumeirah Resort. These contemporary, spacious (49 sq m/527 sq ft) studios are fully equipped with a kitchenette and lounge area including a 37 inch flat screen TV. 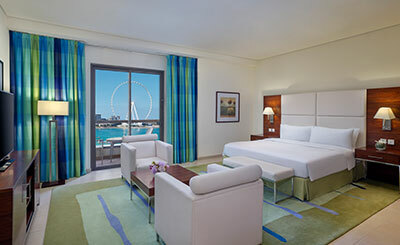 The studios either overlook the Arabian Gulf or the Dubai Marina skyline to provide the ideal base for your business or leisure trip. With uninterupted views of the Arabian Gulf from your balcony, enjoy Dubai your way with the spacious, bright and airy 60sqm/645 sq ft apartment. Including, wireless internet, a kitchenette (including a washing machine, fridge, microwave and breakfast bar), desk space and a separate lounge area with a 37" flatscreen TV. Overlooking the Marina, this spacious, contemporary 49.6 sqm/533 sq ft room is the ideal base for your trip. Wireless Internet available. 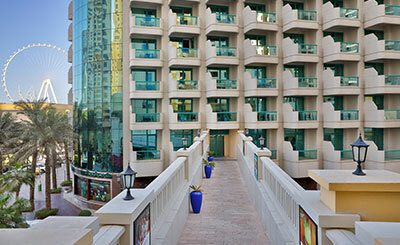 With full Arabian Gulf views, enjoy space and the contemporary style of living in 49.6sqm/533 sq ft room. Wireless Internet available. You will never want to leave the large luxurious apartments ranging from a 2-bedroom family apartment (145 sqm/ 1560) to the sophisticated duplex loft (262 sqm/2820 sq ft). 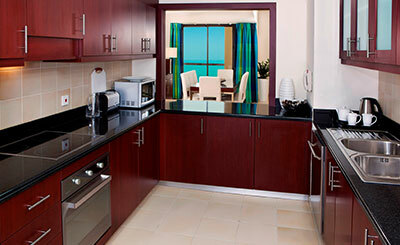 All apartments benefit from a separate fully equipped kitchen, laundry, living and dining room. 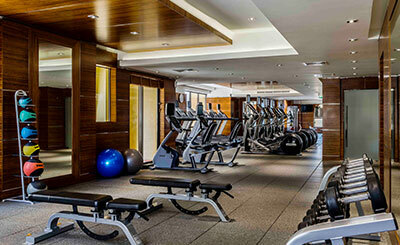 Making it a true home from home whether you are travelling with family, friends or on business.